Electrifying.Gigaset's new flagship model ME Pro targets for a spot in the high-end market with a powerful Snapdragon 810 SoC, an elegant chassis as well as an extra-large 4000 mAh battery. Our review shows why this is not really a success. Model: The Gigaset ME Pro is a phablet sized 5.5 inch smartphone with Gorilla glass front and rear in a high-end stainless steel frame. The large 5.5" Gorilla Glass screen has no openings and protects the phone from dirt and dust. 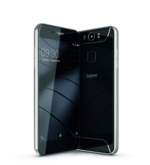 The Gigaset ME Pro comes equipped with high performance technology, Adreno 430 GPU high-end graphics, a 64 bit Qualcomm Snapdragon 810 octa-core processor and 3 GB RAM. This processor offers high-end performance for all apps, games and videos. It also comes with a dual SIM slot, for either two SIM cards or one SIM and a microSD card for expanding storage. The base model of the ME Pro has 32 GB of internal storage, making it an ideal choice for users looking to have a lot of music, videos, and pictures on the go. If 32 GB isn't enough, there are other options, or the storage can be increased by additional 128 GB with a microSD card. The Me Pro's 5.5-inch IPS features Full-HD resolution (1920 x 1080). The Me Pro comes with a fingerprint sensor positioned at the front for secure sign-in. The fingerprint sensor isn't recessed, however, it merely has an outer edge which makes it easy to locate; it's also possible to use it as a camera shutter for selfies and other functions. On the rear side of the phone, there is a 20 MP 85-degree wide-angle lens with optical image stabilization, which means that this smartphone's camera is particularly good at taking videos and images even if the camera isn't perfectly still. The front camera is an 8 MP model with 120-degree wide-angle lens. This model’s singular front panel incorporates "invisible" speakers, which are able to emit audio without any holes or openings in the front of the device, eliminating the need to position your ear over a small speaker opening. This is the same technology as used in bone conducting headphones, which also don't require to be placed inside the ears. 78.94%: This rating is not convincing. The laptop is evaluated below average, this is not really a recommendation for purchase.